If you've completed a half ironman, how long will it take you to complete a full ironman triathlon? 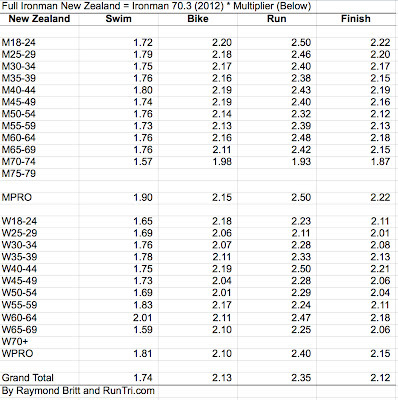 We've previously done a comprehensive analysis examining more than a dozen pairs of races to help triathletes estimate their most likely full ironman times. But the analysis has always been at an overall race average level. Now, we've taken the analysis a step further, developing targets for use predicting full ironman times based on half ironman results, by age group. 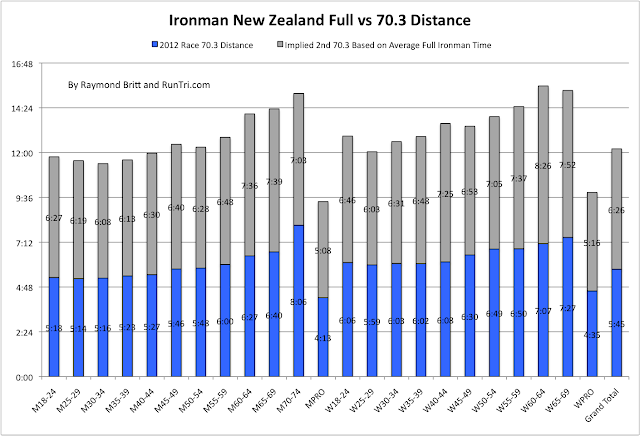 The last minute decision to convert Ironman New Zealand 2012 from a full distance event to a half ironman, due to weather concerns, give us the perfect basis of analysis. The half ironman route at Ironman New Zealand is literally half the full route; one lap bike and run for the half ironman, 2 laps for the full distance. 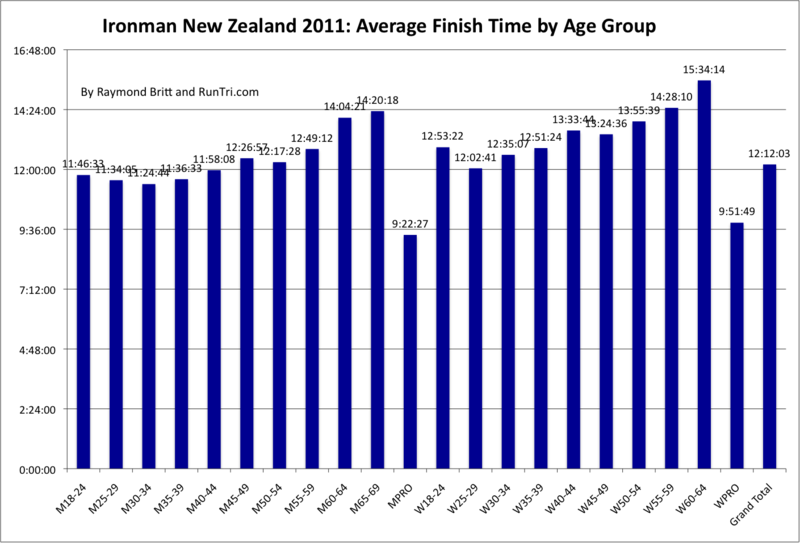 With previous years' finish times by age group for comparison, the answer is: your full ironman time at Ironman New Zealand would be approximately 2.12 times your half ironman time. 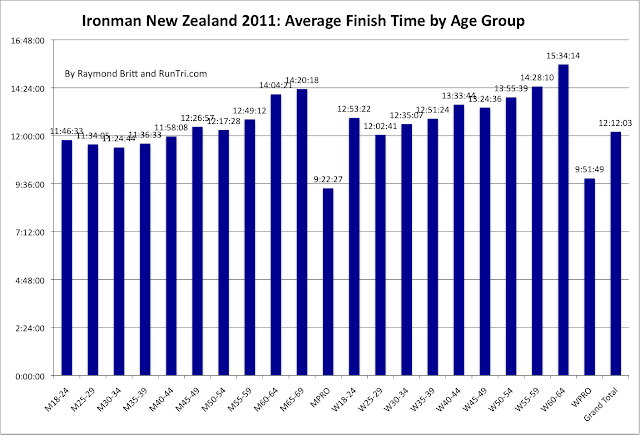 A 5:45 average half ironman in 2012 * 2.12 = 12:12 average in 2011. 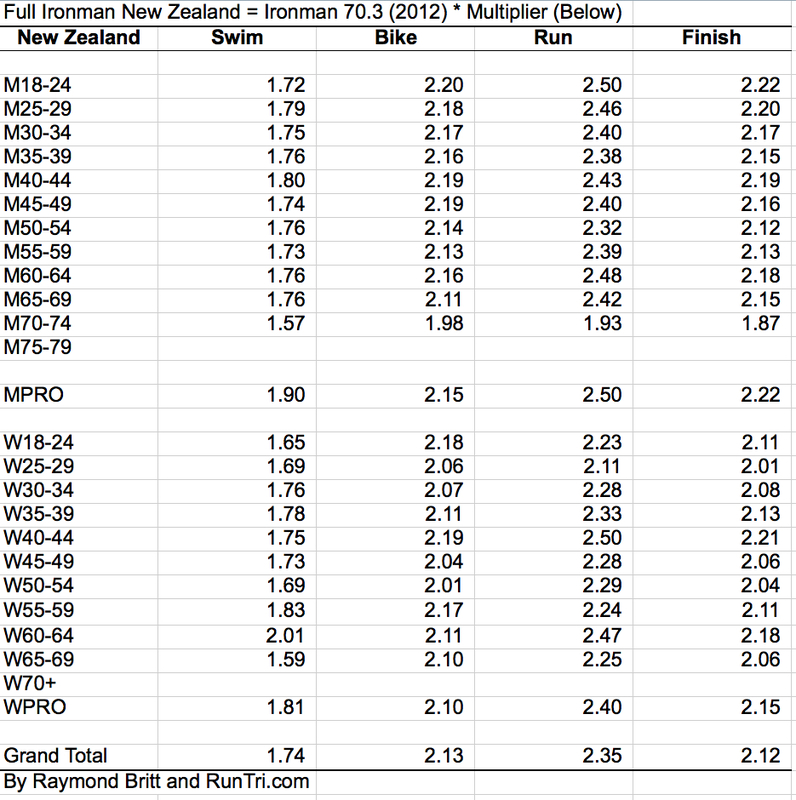 But it's important to note the difference by age group; younger males tend to race faster over the 70.3 distance, likely to take longer on the second half of a full ironman, based on a roughly 2.2 multiplier. How does the multiplier translate into racing time? We've calculated how long the second half of the full ironman should take at Ironman New Zealand. Results are below. A final question that many may ask: does this mean that racing a full ironman is more than twice as hard as racing half the distance? Surprisingly, my answer would be a resounding no. Having raced 29 ironman races, I can tell you with a great deal of experience that a full ironman may seem only 20% to 30% harder. And even that personal difficulty differential has less to do with fitness and more to do with the extended time you're on the course, dealing with the mental challenge of continuing to move forward late into your race when pain and suffering begin to increase. When it comes down to it, most triathletes will tell you: the final miles in any event, from international distance to half ironman to full, if you're racing hard, by the time you reach the finish line, if you've really given it all you've got, it all pretty much can feel the same: complete exhaustion, and the pride of completing a great race, no matter the distance.